Perth has the dubious title of being the most isolated capital city in the world, closer to Singapore than to Sydney or Melbourne. When most Australians think of Western Australia they see the Australian equivalent of the American Wild West, a land given over to mining and large scale agriculture. When they think of Perth they see a mining town inhabited by cashed up bogans and dodgy entrepreneurs. But it is not all flannel shirts, thongs and flakey business deals in Perth, if you take the time to have a closer look you will find excitement, exuberance, and entertainment. So what does Perth have to offer? Well in short everything. Perth boasts more sunny days than any other Australian capital city, and with an average daytime temperature range of 32℃ in summer to 14℃ in winter it is very conducive to a relaxed outdoor lifestyle. In fact the American Consul to Western Australia once said that “Perth has the kind of weather that California thinks it has!”. Situated on the Swan River Basin, by the indian Ocean and at the foot of the Darling Escarpment Perth has some of the finest beaches in the world and some of the world’s most unique fauna and flora. 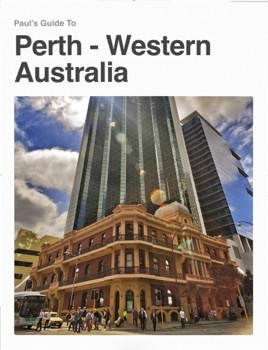 Paul's Guide helps the reader discover Perth with detailed descriptions, maps and photographs, information on Perth’s history and the environment.